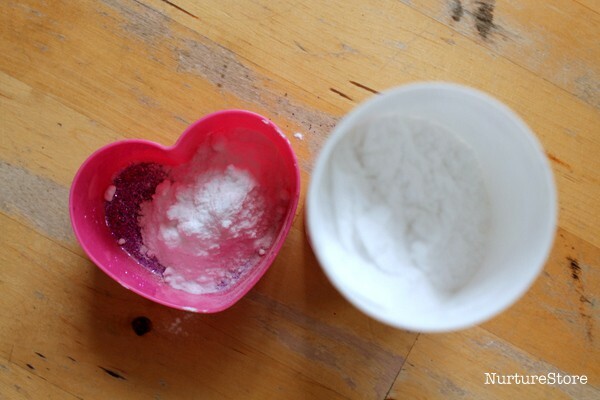 This is a really fun, fizzy science experiment that you can try with your children: using bicarbonate of soda and vinegar to have fun with chemistry. Don’t forget the glitter! 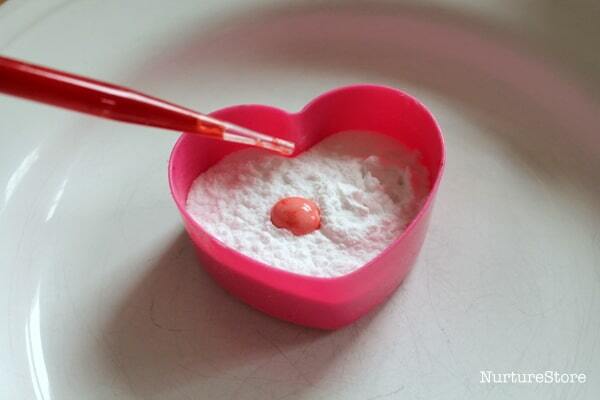 My children love kitchen science experiments and this is one of their favourites. 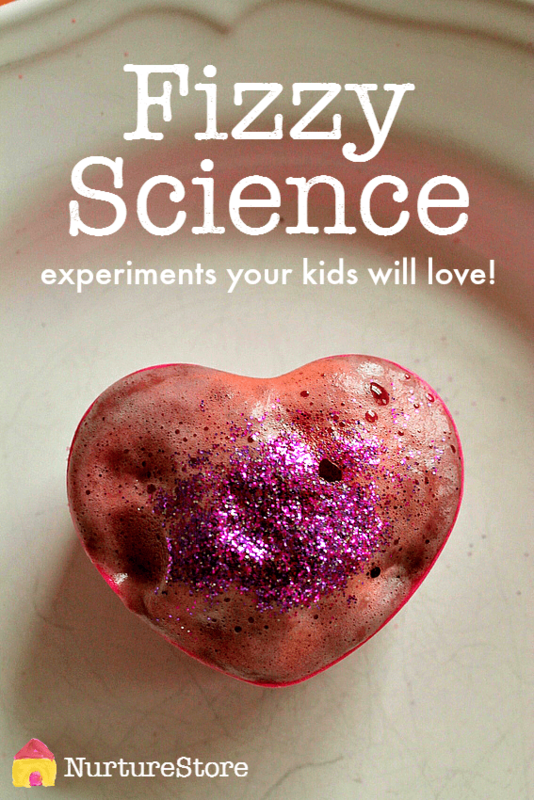 We’re using simple ingredients to create some fun chemistry reactions full of fizz! 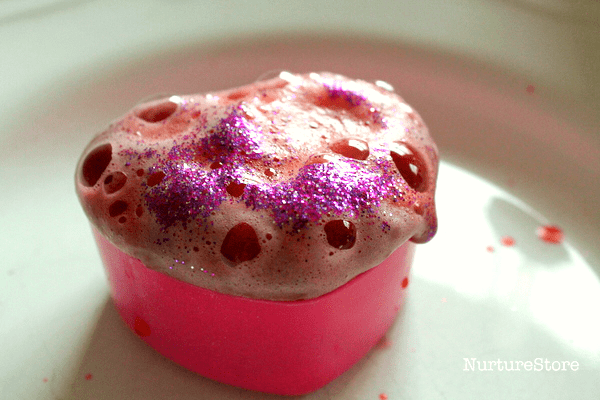 Take a small container and fill it with some bicarbonate of soda, and glitter if you’re using it. 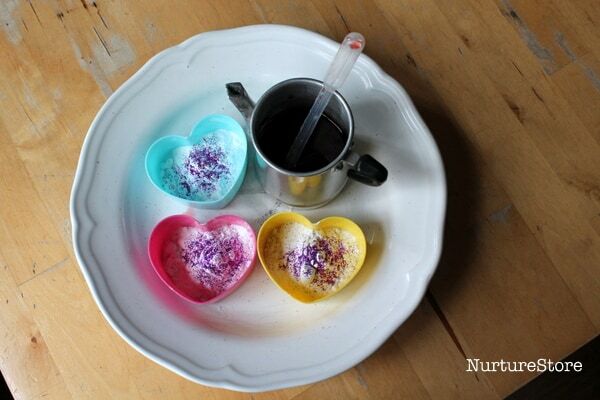 We’re using heart-shaped pots as this is our Valentine-themed sensory science activity. Set out your ‘invitation to fizz’ along with some vinegar. We added some of the food colouring to the vinegar. It’s a good idea to place your soda-filled pots on a tray, plate, or bowl, to help contain the fizz once the chemistry starts to happen. Then it’s time to start playing. We use a pipette to drop vinegar on to our bicarbonate of soda. 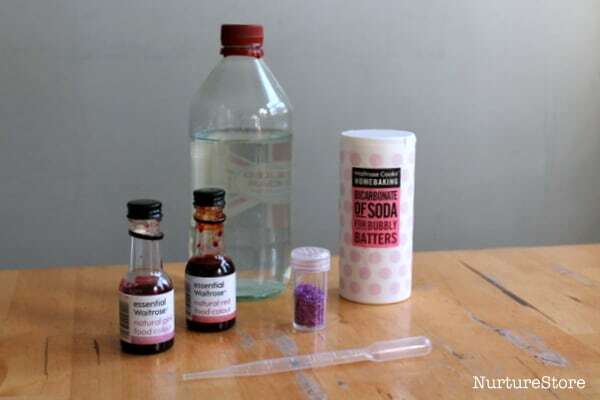 Add a little, add a lot, and watch as the chemical reaction happens between the bicarbonate of soda and the vinegar to make a big fizz. 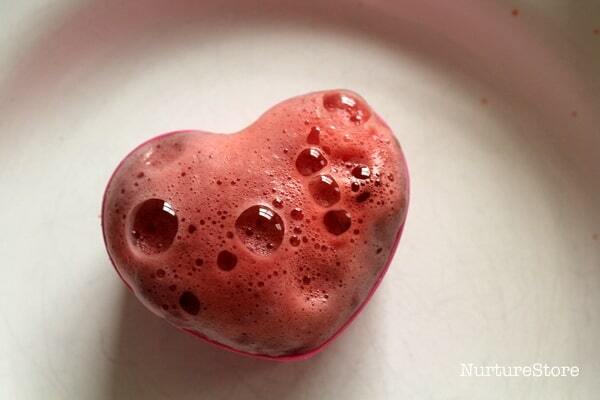 You can keep topping up the vinegar to make your fizzy hearts grow bigger and bigger. Listen to the great sounds it makes! What’s the science behind the experiment? What’s happening to make the fizz? What you’re seeing is a chemical reaction taking place as the base (the bicarbonate of soda, NaHCO3) reacts with the acid (the vinegar, HCH3COO). When they mix together they create carbonic acid, which is unstable. The carbonic acid splits up into water and carbon dioxide – and that’s why you can see and hear all the fizzing. Hello. We tried this today when a friend brought her children round to play with mine. 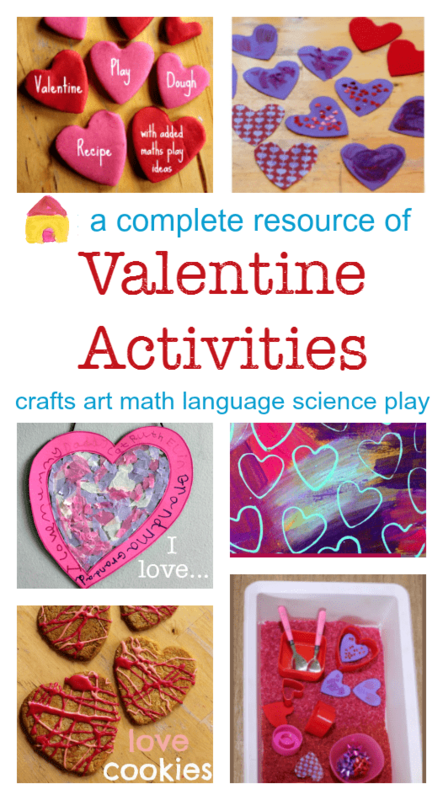 They loved every second and had so much fun; the laughter and constant enthusiastic comments said it all! Thanks for such a fun idea.